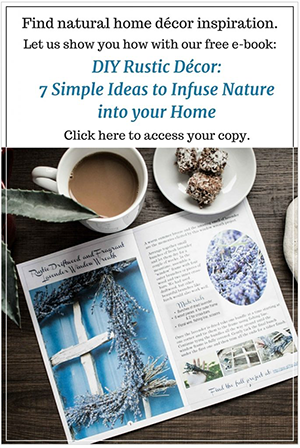 A couple of months ago we participated for the first time in the Canadian Bloggers Home Tours with our Rustic Chic Fall Home Tour. 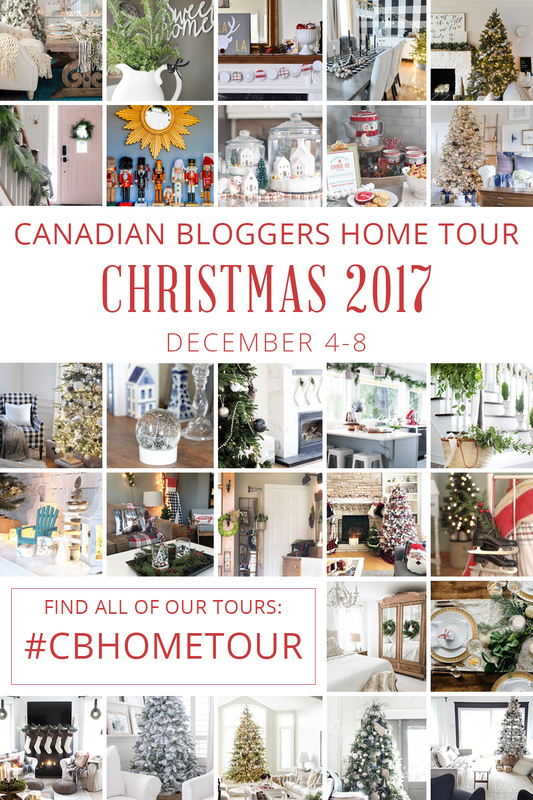 However, this is our first time taking part in the Christmas edition of the #CBHomeTour hosted by Christina of The DIY Mommy and Shannon at AKA Design. Over the last few years we’ve ogled all of the ladies’ beautiful homes all dressed up for Christmas. 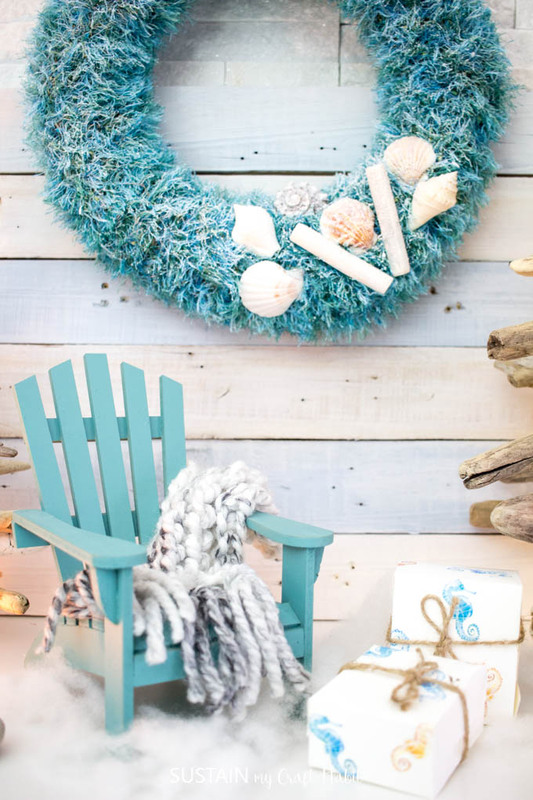 And we’re so happy to be joining them this year with our cozy coastal Christmas mantel. 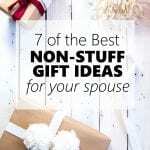 Be sure to visit the inspiring tours linked at the end of this post. 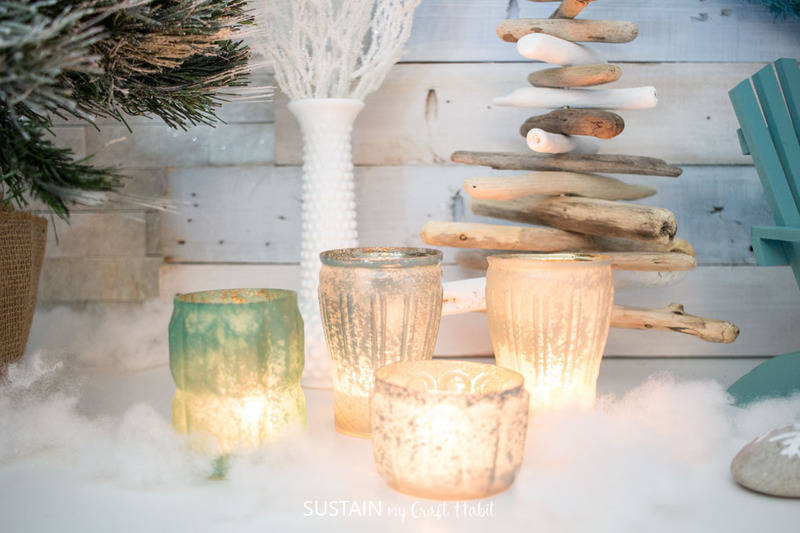 If you poke around here at Sustain My Craft Habit, you’ll notice that we love our coastal decor! Although both Sonja and I live in the suburbs outside of Toronto, Canada, we have have a family cottage near the shores of Lake Huron, Ontario. The beautiful beach and lake inspire many of the projects you’ll find here. 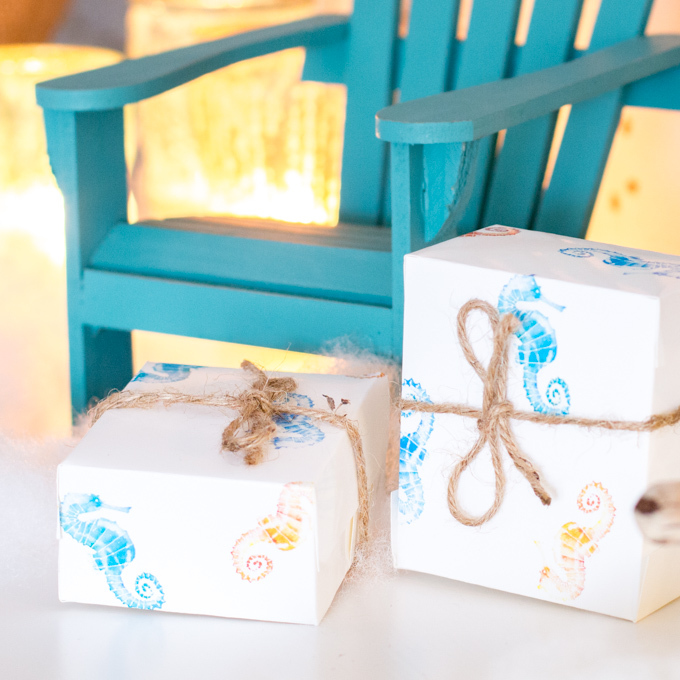 We have a whole section filled with Coastal and Nautical DIY ideas to try. Last year we decorated this same fireplace mantel in a more rustic, Scandinavian-inspired style. This year I opted to go full-out coastal, incorporating a few bought items, some DIYs and some upcycled pieces. 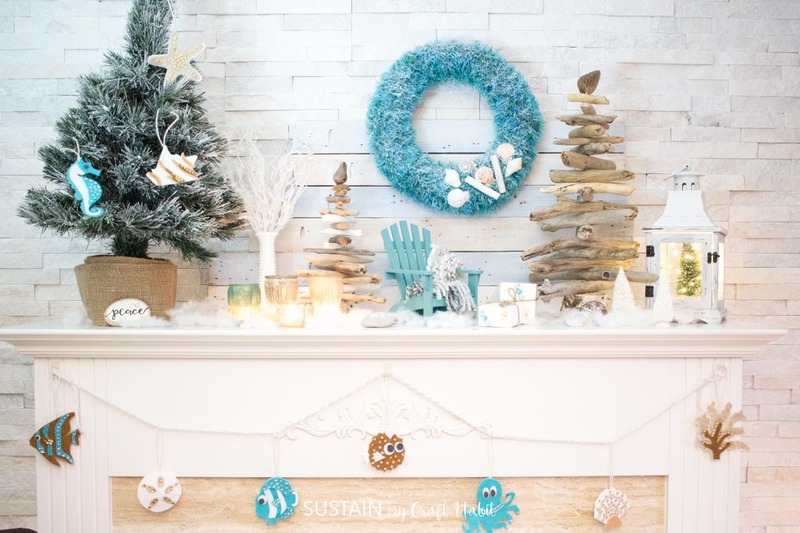 We’re happy to share a video tour of the coastal Christmas mantel with you. 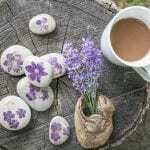 Be sure to subscribe to our YouTube channel for more nature-inspired DIY, craft and home decor ideas. 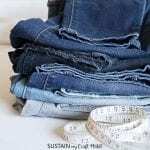 Or read on for the photo tour! 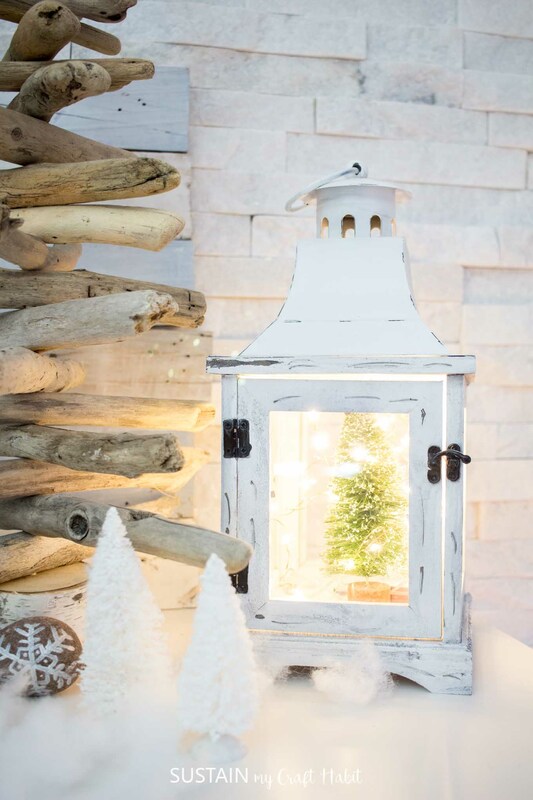 To us, cozy coastal Christmas style means lots of whites, teals, natural tones and textures and warm lighting. I bought this white lantern at Michael’s ages ago. It usually sits on the dresser in our coastal Orchardview bedroom at the cottage. But I recently brought it home and have just filled it with a little green tree and some twinkle lights. 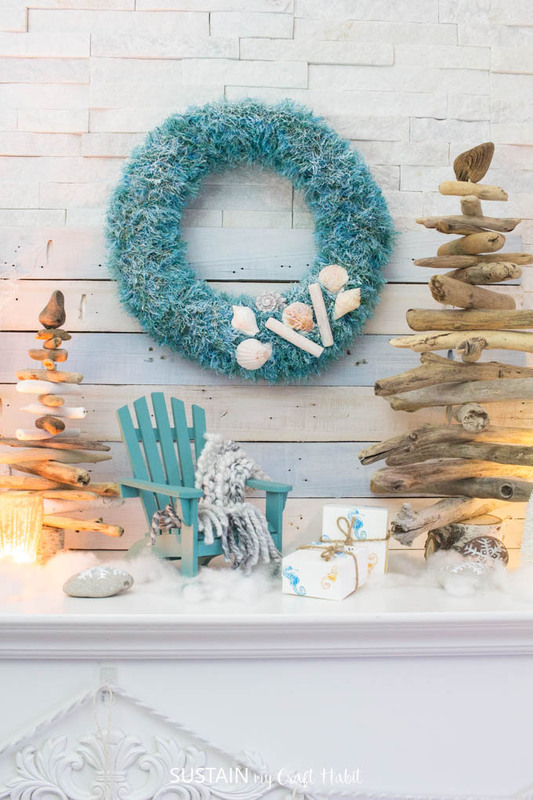 A coastal Christmas mantel wouldn’t be complete without some driftwood Christmas trees! The teal wreath was a fun little upcycling project. I had picked up a straw wreath form and a teal scarf at my local thrift store and with the magic of hot glue: voila! I couldn’t resist picking up this little Adirondack chair on sale last week (also from Michael’s). It reminded me of our own DIY mini-Adirondack chairs made with Popsicle sticks. 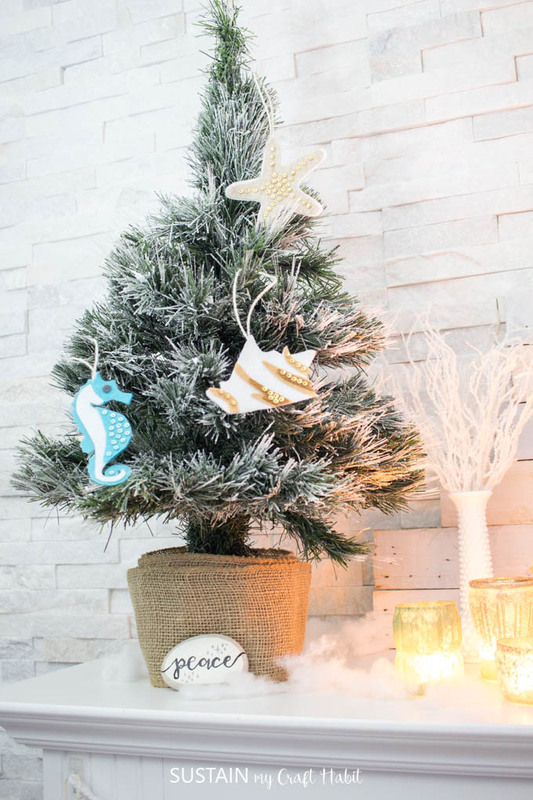 Actually, they would make fun little ornaments for a coastal Christmas tree! I finger knitted a cozy little throw blanket, you know, in case the coastal Santa fairy wants to take a little nap between deliveries. Have you met Rusty? I painted Rusty last spring as an art piece for our beach-themed bathroom makeover. Inspired by Lucy’s (of Craftberry Bush) gorgeous free printable Christmas wrapping paper from last year, I turned Rusty into gift wrap! We’ll have this available to you for download soon 🙂 . Although I thought about it, I didn’t add any string lights to the mantle. These gorgeous mercury glass votives we received from Afloral.com last year as a part of our beach-themed centerpiece idea added the perfect touch of sparkle and warmth to the mantel. A can of snow spray gave this old tree a nice frosty finish. 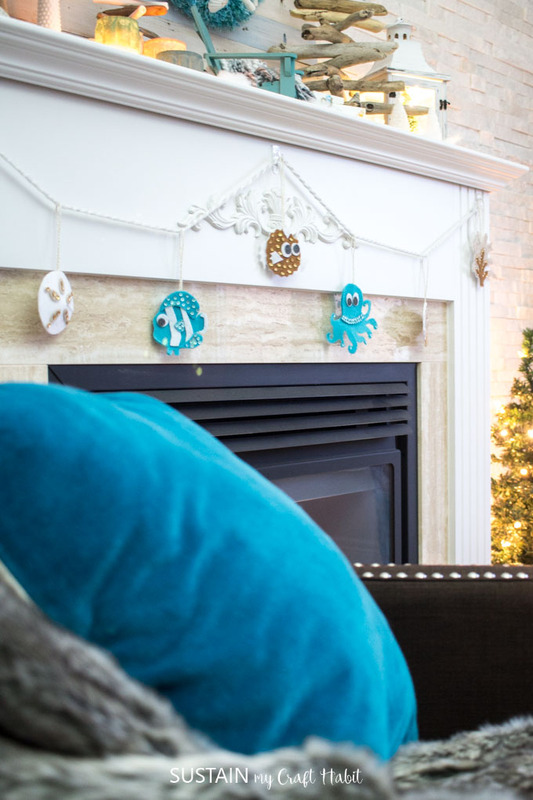 Hung on the tree and at the front of the fireplace mantel are adorable felt coastal ornaments that Sonja designed. I also added a painted stone Peace sign. 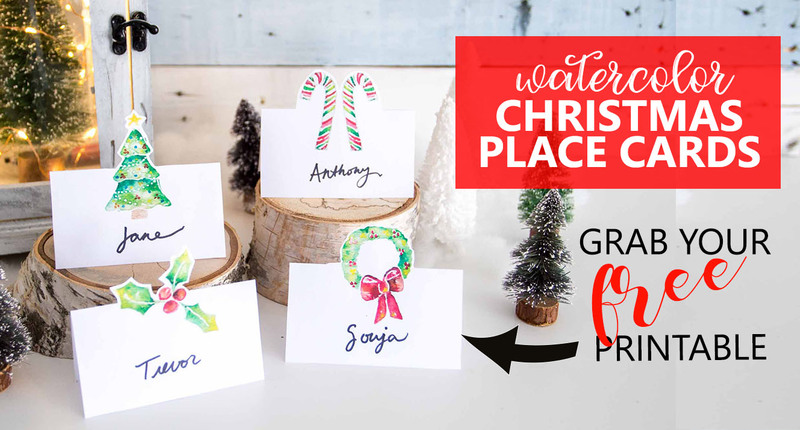 Check out this post for over a dozen more Christmas rock painting ideas to try! 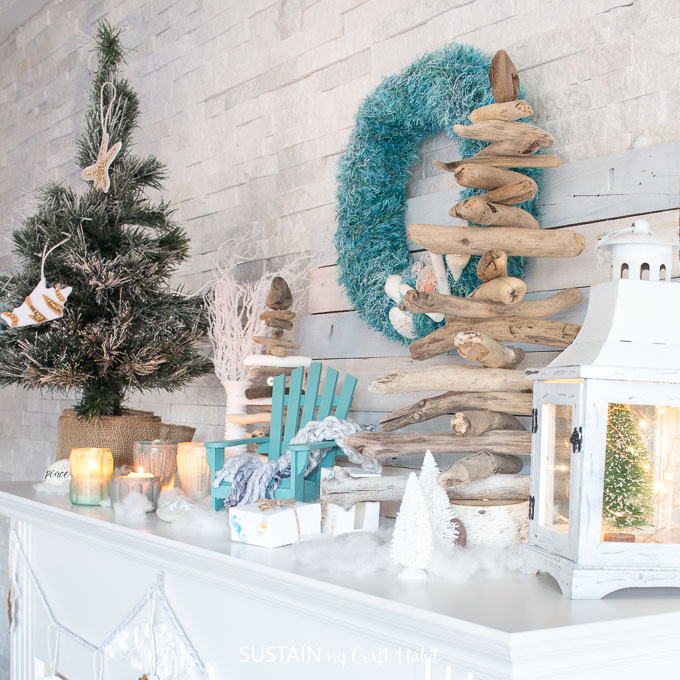 Here it all is: my Cozy Coastal Christmas mantel (try saying that three times fast!). Since I repurposed many items I already had at home, this coastal mantel cost less that about $20 to create. 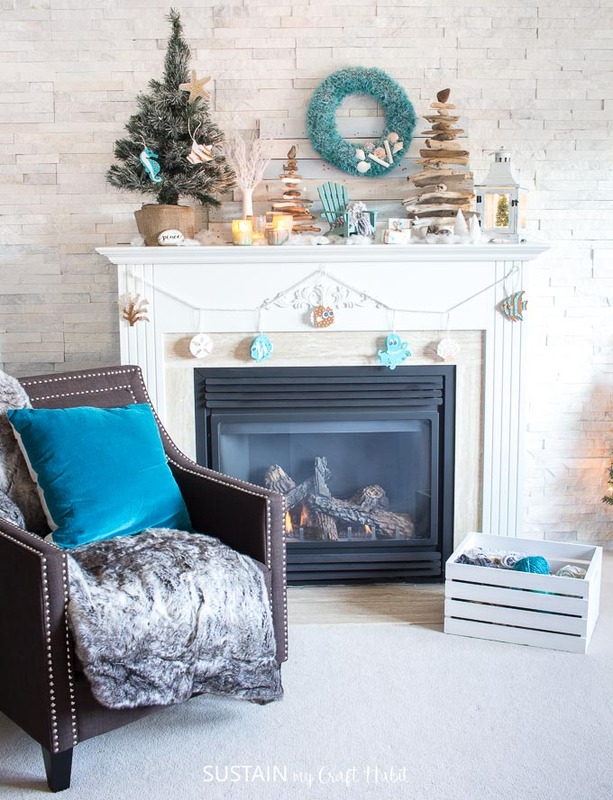 OK, I lie, because I also picked up a new luscious velvet teal throw pillow and cozy faux fur throw to go with the Cozy Christmas mantel ;). Now it’s time to visit all the lovely homes that our lovely fellow Canadian blogging friends have opened up to us. Enjoy friends! This is so fun! Love that little Adirondack chair! Thank you Courtenay! It feels like a magical little world of its own. So happy you stopped by! Those little twinkle lights make everything look magical, don’t they? Thank you so much for stopping by Shauna! Wow! The mantel decorations look amazing! Love the happy colours. My most favorite piece is the lantern. Love how you decorated it inside. Happy Holidays! Thank you so much for stopping by Gabriela, and your kindness. The lantern is a favourite piece- so versatile. Usually it’s filled with the kids’ little creatures though 😀 . Cute space ladies! Love the little mantel scene, it’s so you! So pretty! I love the festive Christmas beach theme and the beautiful blue greens. Thank you so much Jamie. They’re a bit unconventional colours for Christmas, but a fun little change this year. So happy you stopped by! 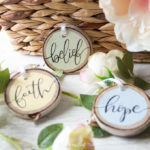 I love love love your driftwood trees! So fun. Super cute! I love the pops of teal and the coastal feel!! So fun! Really beautiful! I love the colour scheme, and those driftwood trees! So pretty! Love your costal vibe! Makes me want to head to the beach. 😉 Great job, love all your little DIY’s too. 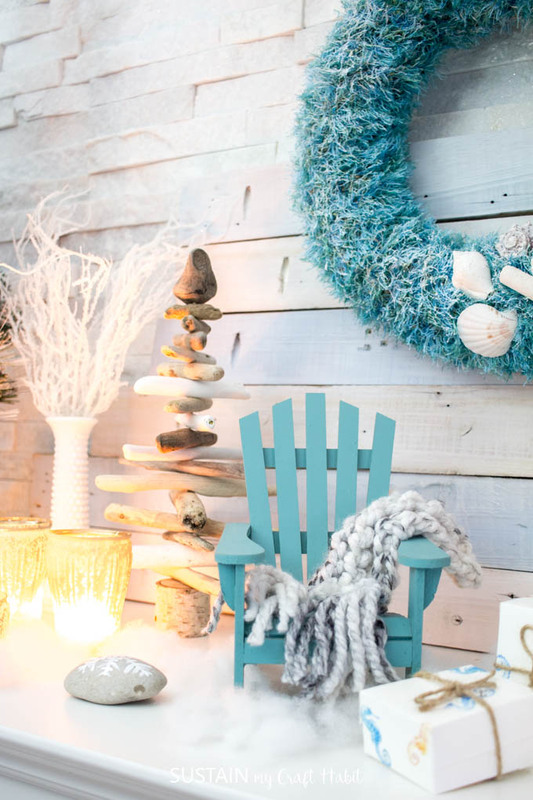 Such a fun costal Christmas – love the colourful decor!